Philadelphia’s Southeastern Pennsylvania Transportation Authority (SEPTA) is a complex microcosm that in many ways represents challenges and triumphs of the city itself. Examining the parts that make up SEPTA and mass transit in Philadelphia (officials, individuals, the city at large) reveals interesting questions of who is represented through mass transit, and highlighting key events through historical, economic and social perspectives reveals that SEPTA may in fact be caught between advancing the status quo, maintaining the bottom line of a business and truly connecting and serving citizens of Philadelphia. SPETA is the last mass transit holdout in a major U.S. city still using tokens. While magnetic swipe monthly passes are available, the primary payment mode requires cash upon entry or tokens pre-purchased from cashiers, vending machines in transit stations and vendors around the city. In many ways the SEPTA token itself is a fitting symbol for the state of mass transit in Philadelphia: a little old fashioned, almost anachronistic, but also endearing and inarguably tangible (Figure 1). One token costs $1.80 but somehow they seem implicitly more valuable, partially no doubt due to the frequently frustrating process of acquiring token. Not every SEPTA station has a token vending machine, and cashiers are only on duty during limited and varying hours; both require cash and, in the case of the latter, exact change. (Murphy’s Law dictates that the chances of two or more of those conditions aligning are slim, especially when you’re in a hurry.) A friend who is willing to lend you a token is a friend indeed, and to further illustrate the weight of its currency, in some Philly dive bars I have even paid for beers with SEPTA tokens. 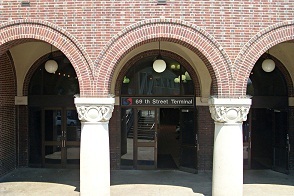 The 69th Street Terminal is the far west endpoint of the Market-Frankford elevated railway line (or the “El”, slightly less famous than Chicago’s version) and is a glorious but well-worn representation of SEPTA’s history in connecting urban and suburban Philadelphia (Figures 2 & 3). Since opening in 1907, 69th Street has served as a center for residents and commuters transferring to and from trains, trolleys and busses. 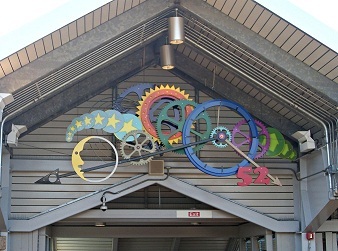 The station has seen several expansions over the past century; it has swollen and buckled to match the economic ebbs and flows of the city around it and carries the wear and tear as proof. Nevertheless, signs of dignity remain in the brick facade and Romanesque-style stone and tile work, and the neighborhood around the station is an energetic blend of traditional and contemporary urban, local shops and restaurants peppered with a few typical city outskirt fast food chains. It’s a little shabby but spirited, casually and proudly Philly. Highly fitting then that the path to 69th Street Terminal from Center City includes Love Letters, a series of murals created in collaboration by the Mural Arts program and a local street artist that “collectively express a love letter from a guy to a girl, from an artist to his hometown, and from local residents to their West Philadelphia neighbourhood” (muralarts.org). 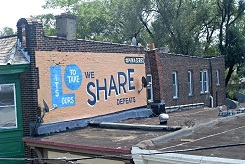 The Mural Arts Project hosts guided tours, which are among the highest rated Philadelphia activities on sites such as Trip Advisor and Yelp, and were even viewed by Prince Charles and Camilla on a recent visit to the city. The 50 Love Letter murals (part of the larger 3,000-plus street mural collection across Philadelphia) are vibrant against the more rundown areas; some are poignant and poetic, others are sweet and silly, most sharp and bright in a town known for being rough around the edges. One reviewer says, “You’ll see abandoned buildings, houses falling apart, [and] you’ll also see new houses. Regardless of their situation, there is love in this part of the city. They are definitely a community on the rise. 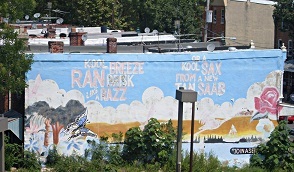 These murals show the quiet optimism of Philly” (yelp.com/a-love-letter-for-you) (Figures 4 & 5). While optimism is certainly apparent, that’s not to say there hasn’t been controversy in Philadelphia’s move toward a more modern and mobile city. In 2007, a transit passenger and trans-identifying woman was told she could not board a SEPTA bus using her transportation pass because of the required sticker that designated the pass-holder as male. In response to this situation and other similar reports over a number of years, an organization called RAGE (Riders Against Gender Exclusion) was formed and rallied for SEPTA to remove these discriminatory and exclusive gender stickers. Many protests, petitions and debates later, this grassroots campaign was finally successful in July of 2013 when SEPTA announced it would cease the use of any gender stickers on all monthly transit passes (phillyrage.org). I spoke with Max Ray, a founding member of RAGE, about his experiences. “They [SEPTA representatives] were always eager to meet with us [but] weren’t ready to remove the gender stickers until it was better for their bottom line.” Ray is very pleased with what he sees as a definite social justice victory but does question some of the political motives behind the decision. “I think there were some sweet moments of learning for SEPTA,” he says, “but there were also some frustrating moments where they told us,’ this is a bottom line issue for us’ “. In the end, he views the positive outcome as an incident that raised awareness for Philadelphia citizens but is not necessarily indicative of SEPTA as a notably progressive organization. In addition to working through episodes of discrimination, SEPTA has been involved in other issues of public space and advocacy. Recent fare hikes to support new technology have caused many lower income residents to reconsider the affordability and accessibility of mass transit. 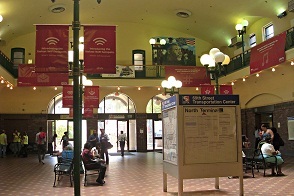 Re-zoning the fare system and eliminating the use of bus and subway passes for weekday travel on Regional Rail substantially increased travel costs for many working class commuters who hold jobs in sparsely served transportation areas such as the Philadelphia Airport and Naval Yard. Meanwhile, transit between some of the more affluent suburban routes was actually cheaper because of the rearrangement in fare zones. While it’s still statistically unclear how many riders in which demographics are negatively and positively affected, research continues, as does the long-term plan for increased fares. Additionally, the relations between SEPTA workers unions and management have grown increasingly tenuous in the past decade with major strikes in 2005 and 2009; the 2009 strike came after the death of a SEPTA worker due to a train rerouting malfunction, and negotiation talks are still ongoing. Getting administration and leadership to commiserate with workers is one matter, but another part of the problem is convincing local businesses and citizens who value their cars and parking spaces that the overall expansion of mass transit infrastructure is in the best benefit of the city. A debate simmers in Northern Liberties, an up-and-coming boundary neighborhood in the northeast section of the city, between developers, community-zoning boards and, subsequently, residents concerning the potential development of a new residential lofts building. The project has thus far been denied due to lack of parking for future residents, even though the developer stated plans to appeal to car-free tenants such as cyclists and mass transit riders who could use the nearby trolleys and Girard Avenue El station (planphilly.com). As Jon Geeting of PlanPhilly explains, the social and economic clashes here are complicated. If the car-commuting residents and business owners who contribute clearly to the growth of Northern Liberties demonstrate their desire for and use of parking spaces, wh y wouldn’t the zoning board support them? Conversely, how is the city meant to increase overall interest in and support for public transportation infrastructure when car-free living and working is not reinforced as a positive neighborhood element? Further, where are the lesser called upon voices in this debate, those for whom public transit is not optional, and how can they be equitably represented? SEPTA releases official statements assuring the public that the fare hikes will pay off and continue to promise a fully operating NPT (New Payment Technology) system, the start of which has been delayed for the past four years. When it finally does go into effect, however, the new system is reported to offer a wider variety of payment choices including a contactless payment system that surpasses any smart card technology currently operating in cities like New York and Washington. An already observable change in the SETPA system is the return of 24-hour service on the Market Frankford and Broad Street subway lines, when only limited bus and trolley routes previously served late-night riders. Campaigns to advertise and foster interest in this expanded service decorate the walls of several transit stations and stops (Figure 7). Figures 7. 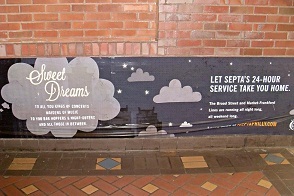 SEPTA advertisements for its 24-hour service. I think Ray is on target in his assessment of SEPTA as an organization caught in “the tension between trying to run like a business and trying to run like an agent of social progress”; SEPTA is a business with a bottom line but more broadly, a reflection of the people of Philadelphia, and both the challenges and the hopefulness are visible. As a Philadelphia transplant who grew up in largely rural parts of Southern Appalachia, I am frequently annoyed with Northeastern native friends’ complaints about the dire state of mass transit in this city. I always ask, “Compared to what?” If you live in almost any other place in the United States, excepting a handful of large metropolitan hubs, public transit is sparse to nonexistent, and SEPTA seems vast and accessible by comparison. There are certainly flaws, some related to the city itself and some attributable to the wider lack of emphasis on mass transit infrastructure in the U.S., but on the whole it is an historic, compelling and critical portrait of the complex relationship between transit and local and social mobility.